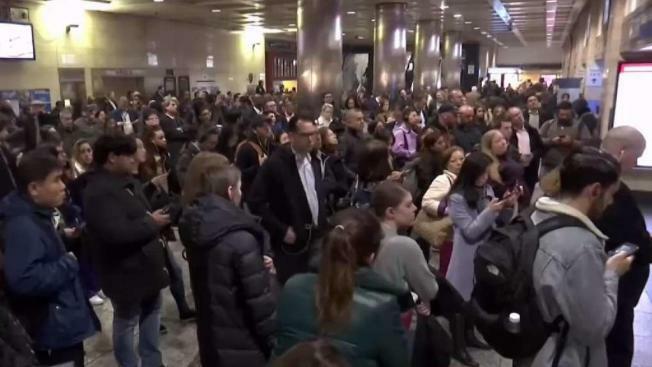 Frustrated Long Island Rail Road commuters littered New York Penn Station at the height of the Monday evening rush after downed power lines plagued the railroad for hours. LIRR service was temporarily suspended on several branches due to a downed power line on the tracks, the agency said. Service was temporarily suspended on the Ronkonkoma, Huntington/Port Jefferson and Oyster Bay branches due to a downed PSEG power line on the tracks west of Hicksville, the railroad said in a tweet. Service had been restored on the Oyster Bay branch as of around 8 p.m. LIRR trains were experiencing delays of around 20 minutes on average, according the agency. PSEG crews had removed the downed power lines shortly before 10 p.m., and service between Mineola and Hicksville was being restored, LIRR said. LIRR service is temporarily suspended on the Ronkonkoma, Huntington/Port Jefferson and Oyster Bay branches due to a downed PSEGLI power line on the tracks west of Hicksville. LIRR personnel are en route to the scene. LIRR suggested using alternate branches, like the Babylon, Port Washington and Montauk branches and said it was providing limited shuttle service between Babylon and Hicksville via the Central Branch. The power line came down across the tracks around 6 p.m., a spokesperson forPSEG said. No one was injured, and an investigation is ongoing.